Has Baseball Become More "Competitive"? Source: Statistics derived from information available at Baseball-Reference.com. Each franchise is identified by the nickname of its current team. Some franchises have changed cities, of course, and some teams’ nicknames have changed, even when the teams have stayed put. 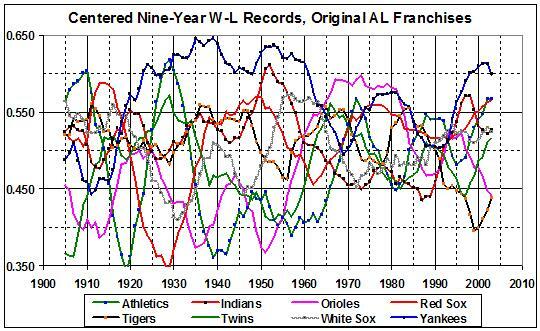 I chose to plot nine-year, centered W-L records for three reasons. 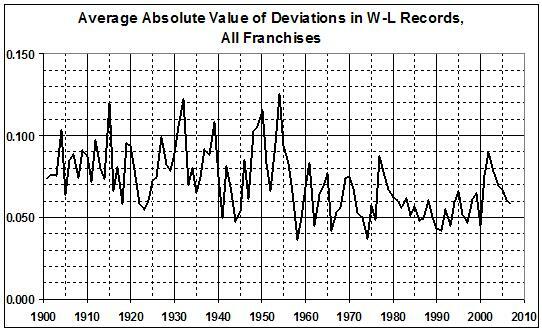 First, a team’s record over nine years should obliterate aberrations: unusually bad or good years. Second, the selection of nine years (rather than ten, for instance) allows for the computation of a centered average. Third, a centered average gives a better indication of a team’s success (or failure) in the year for which the average is plotted. 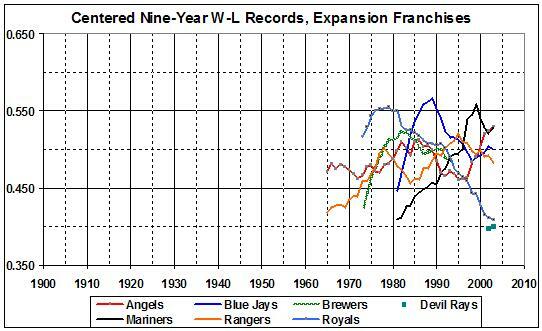 Expansion of the AL occurred in three increments: two teams in 1961 (Angels and Senators/Rangers), two teams in 1969 (Pilots/Brewers and Royals), and two teams in 1977 (Blue Jays and Mariners). For the AL, the addition of the Devil Rays in 1998 offset the transfer of the Brewers to the NL. Expansion of the NL occurred in 1962 (Mets and Astros), 1969 (Expos/Nationals and Padres), 1993 (Marlins and Rockies), and 1998 (Brewers and Diamondbacks). Thus the number of major league teams, which had been 16 from 1901 through 1960, rose to 18 in 1961, 20 in 1962, 24 in 1969, 26 in 1977, 28 in 1993, and 30 in 1998. “Free agency” began officially in 1976, just before the third wave of expansion, Free agency enables a player with six or more years of major-league experience to sign with a team of his choice, following the expiration of his current contract or his current team’s failure to exercise a contract-extension option. Free agency has made baseball more competitive by enabling less successful teams to attract high-quality players by offering them more money than other, more successful, teams. Money can, in some (many?) cases, compensate a player for the loss of psychic satisfaction of playing on a team that, on its record, is likely to be successful. The competitive ramifications of expansion and free agency have been reinforced by the limited size of team rosters (e.g., each team may carry only 25 players until September 1). No matter how much money an owner has, the limit on the size of his team’s roster constrains his ability to sign all (even a small fraction) of the best players. In a future post I will discuss the records of certain teams — the Athletics and their wild swings between excellence and dysfunction, for example.